Keep the bidding going in your live and silent auction with Second Bidder Winner. Your silent auction has gotten off to a great start.You have starting bids on all your items, and you are ecstatic. But later in the evening, your enthusiasm starts to lull when you notice the majority of your bid sheets only have a starting bid and nothing more. 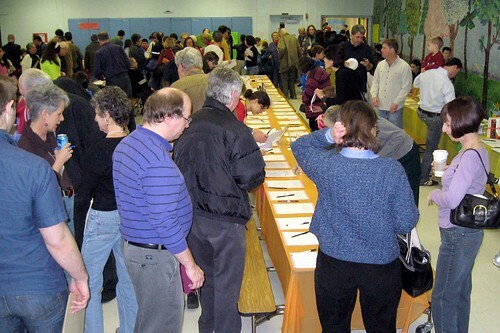 It’s human nature to procrastinate, and auction goers are no different. One strategy organizations use to keep bidding on a more even keel is the second bidder incentive. This is a great strategy if you have an item or items with large bid, or when you have a higher-priced item that you think may not do very well. This version of the Second Bidder Winner offers incentives for the second bid. You can make the incentives or prizes on every item or just on select items. Typically, you can offer something relatively small as an incentive or prize. You might offer a free drink at the bar, or two movie tickets and popcorn Keep the bidding going in your live and silent auction with Second Bidder Winner. for a night out. Or you might offer something that doesn’t necessarily have monetary value, but instead is prestigious — lunch with the nonprofit director or being principal for the day. You can also put all second bidders into a drawing for an exclusive prize. Simply highlight the second bid line on the sheet to make it really stand out. Use another font, or highlight in a color. When two of the same high-end packages have been donated, auction the first as normal to determine the winner and follow up with the second highest bid to offer the same prize at the winning amount—or you can offer it at their second highest bid amount. This type of revenue enhancer works well for live auctions when utilizing popular auction booster packages — no risk travel and experience packages—when you don’t have a sponsor that can donate two of these prestigious types of items. Use the “keep it simple” approach. The simpler your bidding process is, the more bids you’re likely to have. For silent auction use, remember that a silent auction is never silent! Create the buzz. Announce the second bidder incentive, put it in your program, and spread the word while mingling with guests. You must constantly draw attention to your silent auction items throughout your event. Make it fun, exciting, and yes—competitive! For live auction use, make sure you keep the second item a secret from the audience to make sure you have competitive bidding on the first item. Bid increments vary from item to item. Some items make sense to have $5 increments, while others make sense to have $25 increments or more. Your selected bid increments can affect how an item performs, and a good rule of thumb is to set increments at 10 percent of the starting bid. For higher priced items, you might consider an even lower bid increment of 5 percent. Don’t delay the close of your auction because you don’t have enough bids. This is probably my favorite way to raise additional money with a live auction. We just had an event where someone donated a Hog Hunt and with a great auctioneer you can easily get over $6,000 for one of these trips. What the bidders did not know was that the company gave us two trips for the hunt. We sold one for $6,500 and when the auctioneer closed it out at $6,500, he called both bidders to the stage and announced we had two trips and they both won. The second highest bidder was $6,250. This set the live auction over the original goal.